Why did the chicken cross the road? 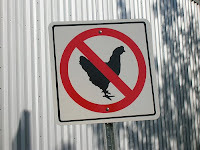 In my case, It's why did the chicken have to cross into my back yard? Do you see where I'm going with this? Let me help you. The phrase of the week is, The baby face killer. That's right, My sweet baby face Golden Retriever Baxter strikes again. He has earned his nickname.....again. He killed a cat once in our backyard. So Shaun and I gave him the nickname of baby face killer. You would think this kind of behavior would come from my Lab Boston. No! It's my sweet looking fluff ball Baxter. Who loves anybody and everybody. Loyal to all that will pet him. I was horrified to find Baxter in the back yard with my neighbors chicken in his mouth. Running around the yard. So proud of himself. Tail wagging at it's fastest. Then me with my mouth opened wide and my eyes probably opened even wider. Horrified!! I had to go tell my neighbor that one of the chicken's got out and made it into our backyard. The arena of death. If you're a chicken or cat. I felt SO bad!!! Poor chicken never had a chance. My neighbor was really nice about it. I told her it was a black one. She said she hoped it was Darth Vader! haha! What a fun name for a chicken. Because Darth Vader doesn't give her eggs. I guess Darth Vader couldn't with stand "the force" aka....Baxter. Boston probably could care less about it and would leave it alone. Baxter on the other hand wants to play. It's not like he rips it up or anything. He just kills it and runs around the yard with it in his mouth. Like a trophy. Gross!! 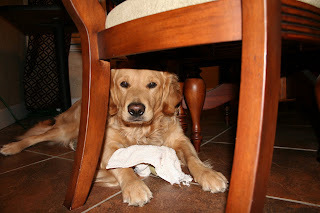 Maybe, He's been watching this other Golden Retriever and wanted to make us something special for dinner? Maybe the Chick-fil-A cow would be proud of Baxter. I on the other hand, Am horrified. 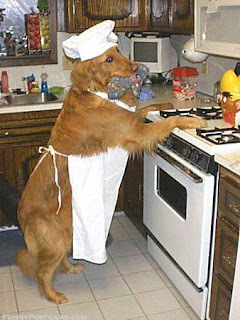 If your dog learns to cook, could he show my dog? Minus stealing neighbors pets I mean. Our dog brought home a DEAD raccoon last week. Ewwwwww! At least the raccoon looked peaceful and not all icky. Small children do live here after all.